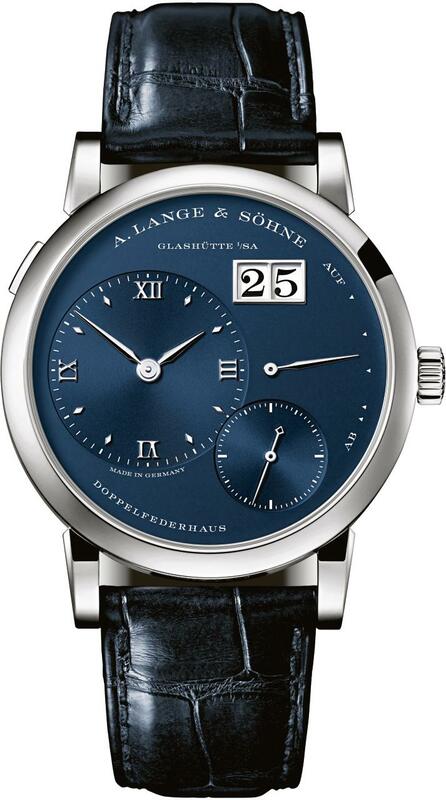 A. Lange & Söhne has had watches with blue dials before. 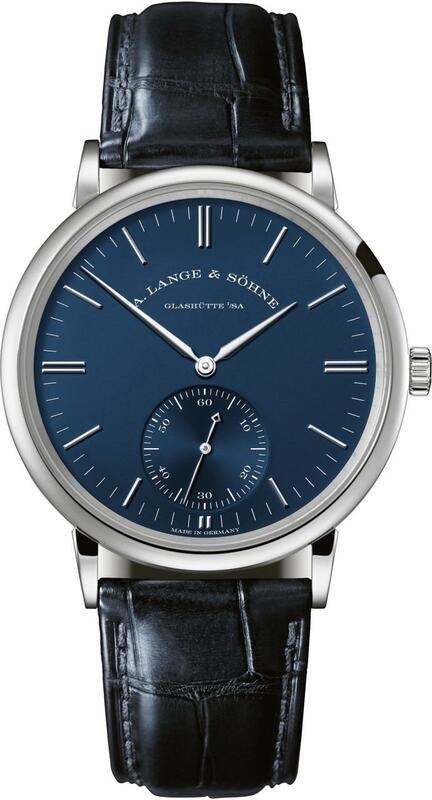 And the brand has previously launched its Lange 1, Saxonia and Saxonia Automatic in white gold cases. But a combination of deep-blue solid-silver dials in white gold cases for all four of the Lange 1, Saxonia and Saxonia Automatic and Lange 1 Daymatic, well that’s music to our ears! The blue dials that were produced for a brief few years were taken off the market for reasons unknown. Yet, like any “classic” they’re now making a comeback and we’re liking what we see. Blue is a timeless color that has always inspired artists, preoccupied scientists, and even took the lead in Mother Nature’s palette. Leonardo Da Vinci described the color of the sky and its expanse as an amalgamation of light and darkness; and that is what Lange has endowed its two manually wound and two self-winding watches with: 18th Century Prussian-blue galvanized dials in solid silver for a more captivating look, accentuated by polished hands and rhodiumed gold appliques. The four Blue Series models feature proprietary manufacture calibers boasting the brand’s quality hallmarks, from the artisanal finissage of all movement parts to the elaborate twofold assembly process. This launch came on the heels of the new 1815 Rattrapante Perpetual Calendar Handwerkskunst with its dial and hinged cuvette in blue enameled white gold enhanced by elaborate relief engravings. All these new models portray the success of the blue and white gold combination. 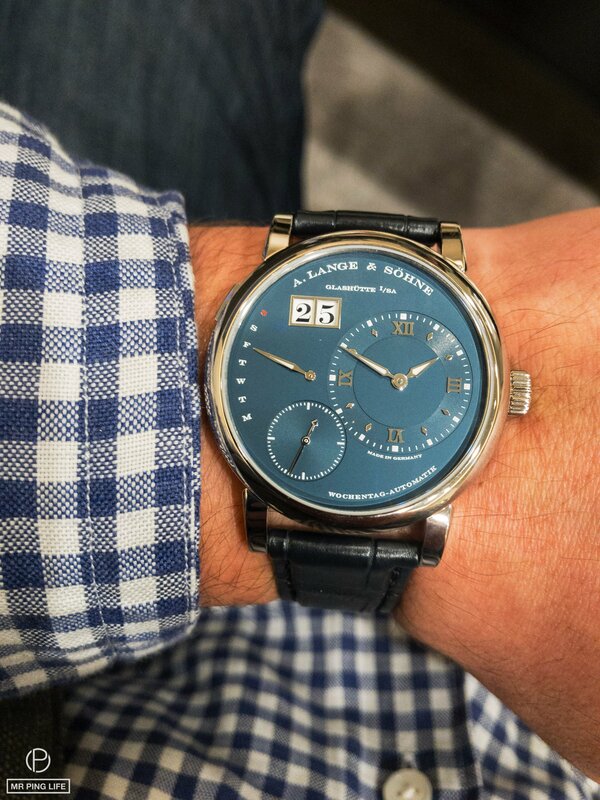 Bummer though: Lange has announced that the Blue Series will be produced in as many pieces as can be made within the year and will be delivered to retailers and boutiques worldwide as such, after which the blue dials will disappear again. We really hope they will reemerge, and soon rather than in many years!